For those who want to lose weight quickly, but do not have enough discipline to follow our Hemp HeartsTM weight loss program -- which requires participants to suffer some hunger in the afternoons and again in the evenings -- Hemp Hearts (REDUCED FAT) FlakesTM and Hemp Hearts (REDUCED FAT) PowderTM offer hunger-free options for rapid weight loss. Those who consume at least 55g (1/2 cup) of Hemp Hearts (REDUCED FAT) FlakesTM for breakfast with berries and cream or yogurt and fruit or even with cereal -- (no sugar or starch for diabetics) -- will not experience hunger again until mid-afternoon. When hungry again, they could consume the same again—or they could add 1/2 cup Hemp Hearts (REDUCED FAT) PowderTM to any soup and consume that with any salad. They can lose one pound per day without difficulty if they restrict portion sizes of other foods. As they lose weight and become accustomed to this diet, they may be so satisfied that they will not always eat twice each day. They must consume sufficient dairy, fruit, juicy vegetables or soup with each meal to make the dry flakes and powder palatable. They should consume sufficient long fibers with each meal to ensure well formed wastes. It is possible to "cheat" occasionally and still preserve perfect digestive health while losing immense amounts of weight—if all cheating is in favor of other high protein and long fiber food combinations--no starches—and if the compressed Hemp Hearts (REDUCED FAT) diet is resumed when very hungry again after each non-Hemp HeartsTM meal. Compressed Hemp HeartsTM are over 50 percent protein and about 14 percent fat, mostly omega fats, so they are a very nutritious choice and can be expected, like Hemp HeartsTM, to promote good tissue health with no loose skin when losing weight quickly. Hemp Hearts (REDUCED FAT) FlakesTM and Hemp Hearts (REDUCED FAT) PowderTM are each available in full cases as 9 x 454 g (one pound) tubs per case. 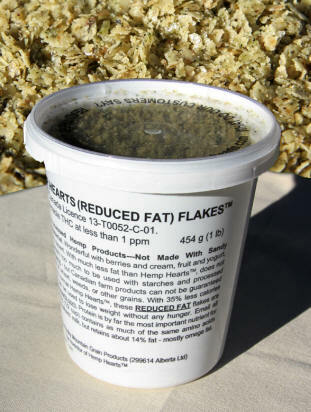 Tubs of Flakes or Powder can be shipped in mixed cases with tubs of Hemp HeartsTM. Where three tubs are removed from a case they can be replaced with 7 More Than a Square meals. Where two tubs are removed from a case they can be replaced with up to 4 bottles of hemp oil. Customers can save many times the cost of these products in reduced grocery bills alone—while losing their excess weight, restoring their health and increasing their productivity. After weight goals have been met---these foods will remain favorites because of their taste, texture and the manner in which they satisfy hunger.